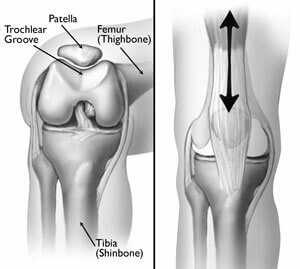 Patellofemoral syndrome, aka Runner's Knee, is a common cause of pain at the front of the knee. The name is rather misleading as it doesn't just affect runners, it can affect anyone. Here we look at answers to the questions most commonly asked about patellofemoral pain syndrome. We will the go on to look in-depth at the causes, symptoms, diagnosis and treatment options for Runner's Knee. 1) What Causes Patellofemoral Syndrome? Patellofemoral pain syndrome is caused by the knee cap not moving correctly within the knee. This can be brought on by many factors, primarily muscle weakness and muscle tightness but also changes in your anatomy. For example, flat feet cause your foot to roll in, putting extra pressure on your knee. For more detail, see our section on the causes of Runners Knee. 2) How Do I Know If I Have Runners Knee? The symptoms of Runners Knee usually come on gradually and pain is often described as an ache around the sides or behind the knee cap. It can be accompanied by a grinding sound or swelling. Pain tends to get worse with prolonged exercise, when coming downstairs or sitting for long periods. To better diagnose your problem, visit our knee pain diagnosis section. 3) How Do You Get Rid Of Runners Knee? You can fix Runners Knee problems in a number of ways. In the short term, resting, ice therapy and Advil/Ibuprofen painkillers should help. Stretching and strengthening your knee is crucial to longer term improvement. Knee braces and special insoles for your shoe may be required but you should seek advice. 4) How Long Will It Take For Runners Knee To Heal? It can take anywhere from 6 weeks to 6 months to recover from Runners Knee, which is also known as Patellofemoral Syndrome. You can reduce immediate pain by resting and using ice therapy but strengthening your knee is key to long term recovery. It’s important to pace your exercise programme appropriately. 5) Do Braces Help Runners Knee? 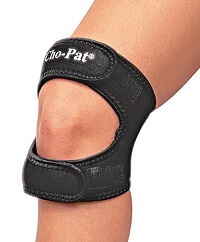 Knee braces can help reduce the symptoms of Runners Knee or Patellofemoral Syndrome by supporting the knee, taking pressure off the joint and improving the position of the kneecap. The ones that work best are knee straps or braces that have a hole at the front so there is support but no pressure through the kneecap. Visit the knee straps section to find the best brace for you. 6) Can I Run On Runner's Knee? It is advisable to rest from aggravating activities if you have patellofemoral syndrome. You can continue to exercise with runner's knee but it helps to reduce the time and distance you run for to allow the knee to heal or switch to low impact activities such as swimming or cycling. 7) How Do You Prevent Runners Knee? Preventing runners knee is primarily about good stretching and good strengthening exercises. Patellofemoral syndrome is caused by the knee cap not gliding smoothly and stretching ensures muscle tightness doesn’t negatively impact movement. Strengthening the leg muscles lowers the impact of forces on the knee bones. Shoe insoles may sometimes be needed. For more information on stretching, see our dedicated knee exercises section. Here we have answered the most frequently asked questions on patellofemoral syndrome. You can find out loads more in-depth information, including symptoms, diagnosis and treatment advice in the Runner's Knee section. Patellofemoral syndrome is the most common cause of pain at the front of the knee, but there are a number of other things it could be. For help working out what is wrong, visit the anterior knee pain diagnosis section.